Paul Max Edlin studied with Edwin Roxburgh, Richard Blackford and Joseph Horowitz (Royal College of Music, London) and Michael Finnissy (University of Sussex). He has won many prizes including Premio Internazionale Ancona, Harriet Cohen Memorial Award and United Music Publishers Prize. 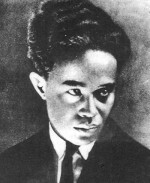 His music explores symbolism and often derives its inspiration from extra musical material. From the mid 80’s to mid 90’s many works were inspired by the art and architecture of South-East Asia, especially Indochina. From 2000 onward symbolism of a wider range of sources guided his music, from the chiastic structures of J.S. Bach to the writings of Gabriel García Márquez and Federico García Lorca and visual work of Frida Kahlo. In the last few years his works have been performed by Arditti Quartet (Frida Sketches), London Sinfonietta (Erendira Dances), Olga Pasiecznik with the Silesian Quartet and Maciej Grzybowski (Ô saisons, ô châteaux), Gabriella Swallow and Southbank Sinfonia conducted by Nicholas Cleobury (Don – a cello concerto and Three Old Gramophones), Johannes Möller (Momentary Horizons) and Cantus Ansambl (A Chain of Wonders). Most recent works and current commissions include Frida (an operatic monodrama based on the life, love and work of the Mexican artist Frida Kahlo), a new work for Sarah Connolly CBE, a commission from the UK Society of Recorder Players and a new orchestral work, Five Illusions. In May 2016, he succeeds Cheryl Frances Hoad as Composer in Residence for London Chamber Orchestra's Music Junction programme. 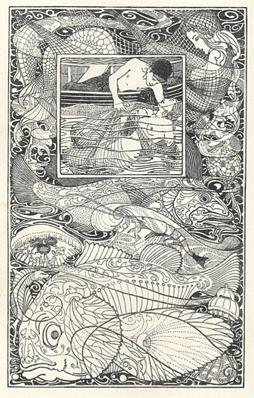 Libretto: Jonathan Kreeger, based on Oscar Wilde’s story The Fisherman and his Soul. This opera in two acts is a retelling of Oscar Wilde’s beautiful but sad tale of a fisherman’s love for a mermaid and how he seeks to be with her. In order to join this ‘other world’, so unfamiliar to him, he must part with his soul. Thus begins a tale that takes us through exotic realms but ultimately leads to tragedy. The city of Angkor is a wonder of the world. Of all its kings, Jayavarman VII made the mightiest impact. But his long life was not easy and he saw cruelty all around him. This opera uses texts from original Sanskrit writings of the period, be they from contemporaneous sources or from actual steles within the city area. The Tales of a Thousand Nights and One Night are well known. This stage work combines opera and ballet to allow us to enter into the heady relationship between Shariar and Scheherazade, while her tales come to life in dance as surreal tableaux that ultimately change him from monster to man. Lorca’s great play tells of love and the strictures of society that cause such unnecessary tragedy. Ted Hughes’ translation captures the poetry and imagery of Lorca’s play like no other writer, responding too to the actual style of writing in as close a way as possible. Frida Kahlo’s life was filled with creativity, passion, political activism and personal tragedy. This operatic monodrama uses Frida’s original texts and shapes them into a work of symbolic intent that digs deep. It is designed to be practically performed in a variety of settings, not least spaces such as galleries. This opera takes its inspiration from two sources. Firstly, from Béla Bartók’s one act opera, Bluebeard’s Castle, and secondly from Jean Cocteau’s mysterious and magical interpretation of La Belle et la Bête. 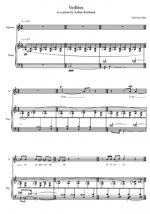 This opera was written as a gift for my partner, Giuliana Gomiero. Fairy tales almost always tell of an innately darker side to life, and they frequently give lessons in moral values, all seemingly wrapped up in a child’s magical imagination. 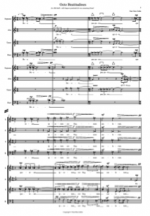 I had become immersed in Bartók’s masterpiece by creating a chamber version. 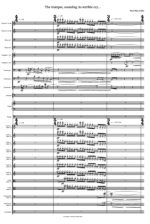 I had delved deeper still into the added musical symbolism Bartók etches within his score, and I wanted to tell a different tale, but one in which the same sort of personal interplay between two principle characters evolves within the setting of a fantastical psychological drama. 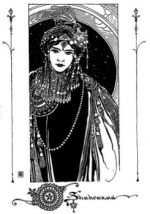 Beauty is curiously drawn to The Beast, just as Judith is to Bluebeard. 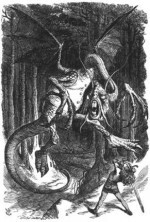 But unlike Bluebeard, The Beast will not allow his own personal dilemma to harm others. The ending of this opera is left purposely unclear. We do not know whether The Beast survives or dies, we only know that Beauty recognises his true good nature. We also do not know to what extent she feels compassion or love for him. The fact that there are seven tableaux within one act corresponds to Bluebeard’s seven doors. The length of each work is also comparable. Additionally, further elements of design and proportion are inspired by Bartók’s way of working. It is easy to see that La Belle et la Bête is personally intended as a companion piece to Bluebeard’s Castle. This early work is inspired by Lewis Carroll’s famous Jabberwocky from ‘Through the Looking Glass’. 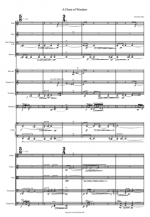 It is suitable for youth orchestras and presents appropriate challenges to students of c. Grade 7 and 8 standards. 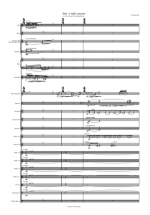 This large scale work is scored for an orchestra of significant size with many percussion instruments. It was first performed by the RCM Symphony Orchestra conducted by Elgar Howarth as part of the Fast Forward Festival. The final work in the cycle of large pieces based on the architecture of South East Asia, this piece derives its form from the temple of Angkor Wat in ancient Cambodia. First perf as ballet “Wild Child”, part of “Prince Albert’s Vision”, Britten Theatre, London (1990). Banteay Srei is an exquisite temple complex only a few miles north of the great Cambodian city of Angkor. The name mean ‘Citadel of the women’ and it is so-called because of its graceful design and petite proportions. The greatest Hindu temple complex in Indonesia is Prambanam. This triple concerto takes both the narrative of the temple and the actual physical structure as a source for its musical construction. This substantial work is inspired by the chiastic designs that Bach uses in his passions, most particularly the St John Passion. 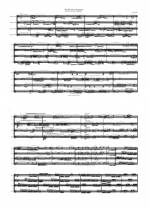 It is composed in a quasi triple concerto type style and the solo parts are highly virtuosic. Don continues a theme of symbolism that permeates and guides so many of my compositions. In this instance it explores certain moral issues in a somewhat enigmatic way, while exploiting the distinct nature of the concerto medium. Indeed it is the master/servant relationship, in which the soloist both guides and follows those around it, that stimulates much of the musical argument. The use of a semi-solo bassoon part acts as a ‘doppelganger’ as well as allowing for that ‘master/servant’ relationship to be explored (hence the title Don as in Don Giovanni and Don Quixote, etc.) The ‘solo role’ in any concerto has dramatic connotations, but it must reach beyond ‘pure theatre’ even if it embraces it. This cello part is hugely virtuosic, as are many of the passages the other instrumentalists have to play. The harmonic impetus stems from the opening chord to the central movement of Bartok’s fourth string quartet – a chord built up of two whole-tone triads which together form a diatonic hexachord. This particular chord, composer and quartet are important to me. There is an inherent symmetry of Bartok’s chord – and the way in which it is expanded as the movement progresses. My work expands it, and symmetrically too, but delves into the world of microtones and harmonies that allude to other cultures. Issues of ‘convergence’ and ‘divergence’ form the basis of the concerto, with the principals of two differing groups (cello and bassoon) responding to the harmonic realms established by each other. While the cello continually sets the pace, its own musical material evolves and adapts as a result of varying ‘influences’ from others. Political issues can be alluded to, of course. Not least in the suggestion that interaction of seeming opposites can share common ground through debate. Bartok’s own music is particularly apposite to use in this way. 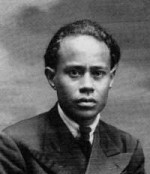 The renowned musicologist Theodore Adorno pointed out that Bartok’s music ‘spans the gulf between, on the one hand, the ahistorical, epic ‘natural community of the pre-industrial world where the ‘individual’ is represented by the hero… and, on the other hand, the highly industrialised societies of the modern world, within which the individual … exists in a state of alienation’. Three Old Gramophones examines symbolism in music, principally in two ways. Firstly, it presents music that appears ‘familiar’ in a generally unmodified way. Secondly, it envelops this music with another layer of sonorities that may appear recognisable, though not necessarily in the context in which it is heard. Three Old Gramophones uses both ‘private’ and ‘shared’ symbolism. ‘Two Gentlemen in Japan’ re-works the overture to The Mikado, manipulating it to sound rather more like genuine Japanese Gagaku court music. This ‘shared’ element examines Edlin’s personal political stance that the West has often abused its relationship with the East. Sousa’s composition El Capitan was (apparently) the last piece to be played as the Titanic sank. El Capitan’s famous demise envelops this piece with fragments of familiar ‘sea related’ pieces. The final piece has several subtexts: principally a re-enactment of a scene in a story by Gabriel García Marquez, where an old woman retells her youthful memories to her granddaughter as they listen to a quasi-Hispanic tune on an old ‘78’. On another level, it also pays a personal tribute to a life tragically cut short. 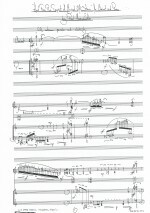 The score also explores new techniques in instrumental timbres and new approaches to notation, where individual musicians ‘lead’ varying groups of instruments, while the conductor maintains an overview of proceedings. This short work was commissioned for a special performance of Mozart’s Requiem on the anniversary of his death. It is designed to precede the Tuba Mirum. A Chain of Wonders takes the listener on an imaginary tour of special and exotic places, usually in nocturnal settings. The very opening borrows from an earlier piece of mine called The Sphinx at Night, itself inspired from an evocative watercolour of the famous Egyptian sphinx under a canopy of stars by Edwardian artist Walter Tyndale. Thereafter, we venture into a set of places that exist only in the mind’s eye. There are certainly places that generate excitement and fear, there are places of gentle solitude, places that allude to grandeur and others of turmoil and finally a place that is surely hot and close in atmosphere and climate, welcoming and comforting, and a place where one would be happy to stay. The piece is short – no longer than some eight minutes. This work relates the legend of the Phimeanakas, The Celestial Palace, that lies in the heart of the ancient city of Angkor Thom. Each and every night the King had to have union with the serpent goddess in order for good to come to the Khmer kingdom. Failure to have this union would bring calamity to the empire. flute, clarinet, viola, ‘cello, piano, perc. 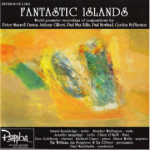 Five Fantastic Islands takes the listener on a journey around a series of imaginary islands. It is unashamedly infused with images of Balinese and Cambodian temples combined with pure imagination – mysterious places in an unreal archipelago. Gabriel García Márquez’s story The Incredible and Sad Tale of Innocent Eréndira and her Souless Grandmother is one of his most disturbing and moving short stories. The young heroine is forced into prostitution by her wicked grandmother in order to repay for the loss of the home – the result of the ‘wind of misfortune’ blowing a candle against a curtain. In this incredible tale of love and loss, of tenderness and cruelty, humanity at its most raw is fully revealed. This chamber work forms the basis for an opera that never has yet been, but might one day. It is full of symbolism and imagery, conjuring up the heady atmosphere of South America and of all the surrealness our protagonists experience. The great Colombian writer, Gabriel García Márquez, wrote his surreal novella The Incredible and Sad Tale of Innocent Eréndira and her Souless Grandmother in 1978. Eréndira Dances captures the essence of this story. It takes music from an never completed opera – the rights proved impossible to acquire. In the first of the three dances, the two main characters of the drama, Eréndira and her Grandmother, are introduced. Eréndira, a wistful yet always busy young girl, is portrayed by the flute. The domineering and incredibly demanding Grandmother, with all her erratic and persistent nature, is depicted by the cello. Surrounding these two protagonists is their home, an old house full of clocks and antique relics from the Grandmother’s past life. The strange surreal environment, set in the heat of the Hispanic landscape is caught from the beginning. Eréndira baths her bloated Grandmother as the wind of misfortune stirs. The second dance reveals snapshots of Eréndira’s now troubled life. Time has moved on a pace and the havoc caused by the wind of misfortune has seen the Grandmother’s home burned to the ground, and Eréndira has been forced into prostitution to pay off her debts. She will be a prostitute for years to come, and the Grandmother has made Eréndira the most famous and busy prostitute in all of South America. By chance, a handsome and innocent young man, Ulises, has met Eréndira and fallen in love with her. They make love in Eréndira’s tent. Their relationship has far to go. In the meantime, the Mission has made an attempt to rescue Eréndira from the wicked Grandmother. She finds herself at peace in the mission and hears the soft music of Bach played on a clavichord. She is free from her terrible world at last. Dance 3 reveals two more snapshots of the last part of Eréndira’s story, now that she is back in the clutches of her Grandmother having been snatched back from the Mission. 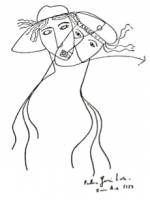 In the first snapshot, Eréndira is alone at night when Ulises creeps into her tent and they make love as the Grandmother sleeps, burbling away in her usual manner. The Grandmother’s frenetic burblings, now depicted by the violin and finally the viola, are coming to an end as she has been poisoned and stabbed repeatedly by Ulises. When she is finally dead, Eréndira runs away leaving Ulises by the side of the Grandmother’s whale-like body. 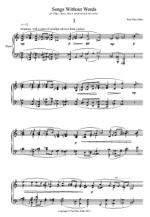 Mezzo-soprano, flute (doubling picc. and alto fl. ), clarinet in A, violin, piano, perc. 7 trumpets (piccolo, natural, Eb, Bb, bass trumpets, flugelhorn), perc., piano, organ. 7 trumpets (piccolo, natural, Eb, Bb, bass trumpets, flugelhorn), perc., piano, 2 cellos, 3 double basses. 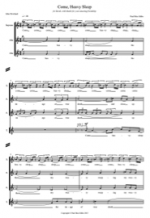 New version made for RNCM ‘After the Silence… Music in the Shadow of War’. “One woe is past. Behold, two more woes are coming hereafter”. When John Wallace formed the Wallace Collection, he brought together the finest trumpet players in the United Kingdom. Legendary names of the past such as John Wilbraham and David Mason joined forces with the finest up-and-coming players such as Mark Bennett and Bob Farley. Their first concert was to be in the Queen Elizabeth Hall and John Wallace, then my trumpet teacher at the Royal College of Music, asked me to compose a piece for this remarkable ensemble. I wanted to create a work that would leave a message and provoke thought as well as being a demonstration of virtuosity. The biblical story of the seven trumpets of the apocalypse from The Book of Revelation lended itself to this instrumentation as well as my intention. Here was the profoundest allegory that responds to the results of man’s inhumanity to man and his environment spawning suffering and torment in the most dramatic ways. The parallels with the horrors of war need no elaboration. ‘The Fifth Trumpet’ describes an initial vision of Heaven from which the Fifth Angel blows his trumpet. A star falls from heaven creating an earthly abyss from which smoke pours and the locusts with scorpion stings inflict months of agony on mankind who seek the solace of death. But death evades them. The programmatic intent of the story should be apparent in the clearly defined sections of the piece. A range of trumpets are used: piccolo trumpets, natural trumpets in old pitch keys, Eb, Bb and bass trumpets. 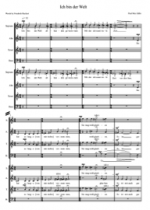 Together with these are percussion, piano and either organ (as in the 1985 original score) or 2 ‘cellos and 3 basses (as in this 2014 revision). 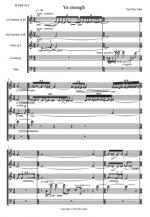 The trumpet writing pushes the instruments to extreme limits, not least the 5th trumpet part, which has specific solo passages and which was written for John Wallace. In the first performance, the 4th trumpet part was played by wonderful John Miller, now Head of Brass at the RNCM, the conservatoire that requested this new version be made. 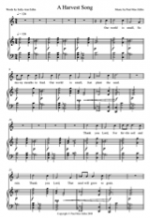 In the 2014 revision, several changes have been made: the organ part has been reworked for lower strings and there has been some rationalising of barring and some minor simplification of the actual instrumental parts. 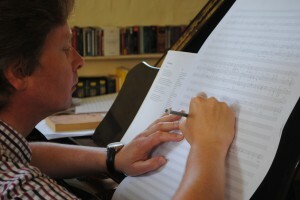 It is not new to draw on another composer’s music and make it a starting point for one’s own work. Nor is it new to use that existing music – especially music that has an ‘implicit’ meaning – to represent something symbolic. ‘tis Enough is such a work. It draws on the music of J.S. Bach (his famous cantata Es ist Genug) and it moulds, develops, suggests and integrates the opening aria throughout the first movement of this three-movement composition. It also informs the direction of the substructure of the rest of the work. Frankly, I was intending to use Bach’s music in an opera (at a highly symbolic moment), but untold problems set in with that piece. I had ‘had enough’, and this brass quintet emerged. It was a way of saying something in public in the best and most profound way I could, with the group of instruments I grew up with (I was a trumpeter). The first movement grows out of murmurs, out of whisperings and secrecy. The music twists and turns and occasionally Bach’s music can be detected more apparently. At one point the trumpets erupt with a literal scream (not of anguish, more of frustration). Then the murmurs continue. The second movement is something of a firecracker. It is over almost as soon as it has begun, all the instruments working in the same direction and only at the end going their separate ways. (Bach is still there, but imperceptibly.) The final movement is serene – the calm after the various storms. Each instrument is used delicately, the principal trumpet soaring above the others with an intentionally beautiful line. Again Bach’s music permeates and guides, but unnoticeably. It is easy to see that the master’s work had allowed me to put things in perspective. This work was commissioned by The Park Lane Group for four exceptional young trumpeters to play in the Park Lane Group Young Concert Artists Series. The work is dedicated, at the request of the Park Lane Group, to the memory of Philip Jones – one of my idols, whose influence in brass ensemble playing of the twentieth century remains unparalleled. The trumpet itself has developed beyond all measure in the last thirty years, in technical terms of construction and the facility of musicians who play it. It is now an instrument capable of playing florid lines, extremes of range and dynamics, etc. This work intentionally explores the various characteristics of the instrument as well as techniques that recent advancements in engineering have made possible. Quarter-tones, low ‘pedal’ notes, valve tremelos and a variety of mutes are a few ways in which alluring sonorities and a palette of timbres are achieved. The title refers directly to the first four trumpets from the Book of Revelation. About twenty years ago, I wrote a piece called The Fifth Trumpet for The Wallace Collection – a symbolic work on this Biblical theme. With four trumpets available, I felt impelled to return to the subject. 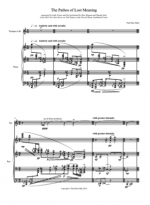 The design of this new composition reflects the shape of the appropriate chapters, where increasing trumpet calls generate tension through counterpoint, set against images of a changing landscape. 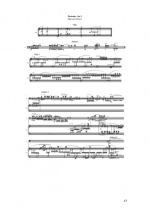 This work was composed with the lyrical and mellifluous sounds Sarah Field produces on her soprano saxophone. That said, all sorts of other influences began to emerge: the idea of the Phoenix, and its playfulness and the mystery associated with such a beautiful mythical creature. Then the idea of flames, regeneration and transformation seeped in. Finally, Angkor (a place which has haunted me and pervaded my music for many years) impacted. The Garuda (the Khmers’ own mythical bird) and the images of Apsaras (heavenly dancers) that richly grace the walls of the great exotic Khmer temples all played their part. The main notes of the work are derived from the musical equivalents to the word ‘PHOENIX’. Those notes are transformed in multifarious ways (turned inside-out and upside-down, etc) and the harmonies, and the ways in which material is developed, all stems from this original pattern of notes. 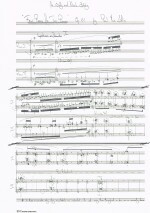 The work is dedicated to the two musicians who I so admire, and who very kindly asked me to write it. This personal work was initially born from a lecture given by writer Sarah Wood on the interrelationship of music with other art forms. She used three words ‘pathos’ and ‘lost meaning’ that struck me particularly – I knew I had a title for my new piece. Ultimately, in this imaginary journey we search for truth amid the chaos of life. The music also refers and responds directly to history. Beethoven’s deeply nostalgic Piano Sonata no. 30, Op 109 seeps into the composition, helping to similarly guide us. Beethoven’s music seems to me so inextricably linked with compassion and humanity, something that lacks in far too many people. Thus there are twists and turns toward a seeming apotheosis. Yet, despite all the lyricism, the plaintive calls, the fierce passages and the music’s own path toward a climactic end, that same level of doubt remains throughout. Beethoven’s muse, and the cries of its other source of inspiration, all lead to a work that cannot truly cope with what confronts it. 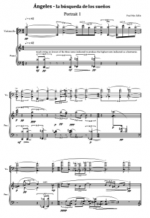 This work was sponsored by Lady Fraser and was first performed by Huw Morgan and Timothy End in the PLG New Year Series on 13th January 2011 in the Purcell Room, Southbank Centre. All art forms provide means to express innermost thoughts, personal feelings, expressions of care, nurturing, friendship, love, anxiety, political concern, etc. Art allows us to say things that are important to us, and, as we are all so different, from various backgrounds and born into diverse cultures and cultural identities, we adopt different means to express ourselves. Music allows us to be extremely honest, yet extremely obscure. In music (it being an abstract art form) we can create our own rules, and within these rules (the parameters that we set ourselves) we can create our own languages. These languages can be either understood (i.e. if it is a common language that we can understand [in music such as the relationships of keys within the conventions of tonality]) or left mysterious (just as listening to Sanskrit will enchant and beguile us but leave many of us totally perplexed at what the words actually mean). Composers can create ways to symbolise events and thoughts, they can tell us truths disguised in groups of notes, they can be open and honest in unparalleled ways. Forms can represent journeys, events, structures of buildings, etc. Numbers and durations can be used to represent actual time, place, proportion of endurance, etc. Notes can be aligned to names and places and events by means of encryption. Other existing works can be alluded to in order to allow the listener (if they are aware of those other existing works) to sense subliminal or literal allusions and thus achieve a sense of nostalgia within oneself or within the subject matter presented, or both. These ‘Portraits’ tell many things. They tell us of people, of places, times and of events, and they respond to the actual creativity of those people. These portraits tell us of the dynamic of relationships, from within and from without. They simultaneously delve deep and they observe from a distance. In creating these ‘Portraits’, I become a conjuror. A fortune teller, a story teller, a friend, a guide, someone who responds to events, someone who considers possibilities, someone who observes and comments privately, someone who wants to share secrets in such secret ways that the listener can only ‘sense’ the truth. I do not want to say it all. I want the music to speak in its own terms. I do not want to be obvious and literal to the listener, even if, deep down (via music) I am being completely literal. I can transform reality into magic, as if my photographic lens has been adapted with filters galore to transform every image into a surreal and abstract representation of the same. A dedicated musicologist could decipher the codes and work out the truths. They will learn about the people and the places and the events and feelings contained within. They will discover my innermost thoughts. In so doing, they will begin to chip away at the magic that the obscurity of intent ensures. What I can tell you is that these portraits tell of and are dedicated to people who are extraordinarily special to me and whose friendship has meant or means more than words can say. 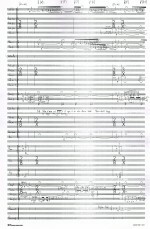 The music was composed over the summer of 2012. Two sets of portraits describe four artists – Aleksei Kiseliov, Olga Jegunova, Ángeles Ciscar and myself. The music tells about our characters, special experiences and the natural life journeys from childhoods to the present moment. 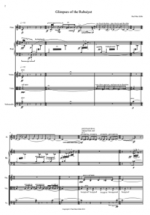 This short work for unaccompanied trumpet explores the more lyrical side of the instrument as well as some of the techniques it can achieve that take it away from the conventional range of timbres we associate with it while retaining a keen sense of beauty and the exotic. A melodic line exists throughout, though this is broken by passages of a more virtuosic nature, which, while interjecting, never disturb the intended flow of the music. The note C is the note from which the entire composition is derived, yet it is the one note we never hear at all. Thus the work finishes with a sense of lack of resolution, of wanting something that never existed, yet one wanted, subconsciously, to enjoy. 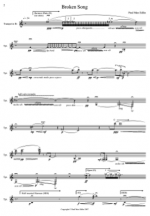 It was written for the outstanding Canadian flautist Lisa Nelsen. 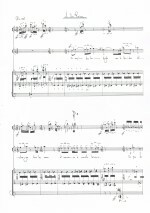 An early work, composed at the start of studies at the RCM. 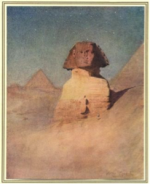 This set of six short pieces captures the vivid imagery of ancient Egypt as depicted in the often charming watercolours of Edwardian artist Walter Tyndale whose book ‘From and Artist in Egypt’ became an inspiration. We move from the awe inspiring image of the great Sphinx at night, to the hussle and bustle of street markets, the natural flora and fauna of the region and more of the antiquities such as the tombs of the khalifs. These short pieces can be played as a set, or movements can be played on their own, especially ‘The Sphinx by Night’, which is a dramatic work, yet is not technically as demanding as the others. The ‘towers’ of the title are those of Cambodian King Suryarvarman II who built the vast funerary complex of Angkor Wat, now considered one of the seven wonders of the world. The music responds to the ground plan of the building and takes us on a literal journey through parts of the space, frequently responding directly to narrative bas-reliefs such as ‘The Churning of the Sea of Milk’. 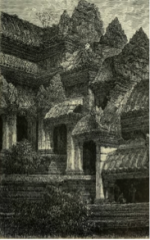 While this work stands up in its own right, it became the basis for a much larger work, ‘A Pilgrim of Angkor’, which is for full symphony orchestra, that work completing what was for me a compositional odyssey in which many monuments of South East Asia, informed and inspired my music. These two ‘books’ respond directly to Immanuel Kant’s ‘Analytic of the Beautiful’ and his ‘Analytic of the Sublime’. In order to clearly allude to these important works of philosophical debate, the third exquisite and highly poignant movement of Beethoven’s Piano Sonata in Major, Op 109, becomes more than a skeletal framework for the compositions. In Book 1, and within the spirit of the ‘theme and variations’ design as used by Beethoven, the music evolves from a stark presentation of ideas, gradually exploring these in a series of diverse and occasionally terse ways, yet always with a keen eye to aspects of symmetry and grace of pattern that ultimately reveal their beauty as opposed to their sublimity. Book 2 goes further and uses Beethoven’s melody as a starting point to an exploration of its line via use of harmonic and sub-harmonic series. 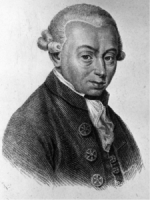 Beethoven’s music makes this music, though it would be impossible to perceive without prior knowledge. The complex series of lines that make up the first of two movements in Book 2 are delineated by the use of colour. 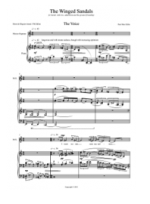 The second movement is utterly serene and hopes to finally respond to the sublime due to its understanding of what makes things ‘beautiful’ and that nature and natural process is what takes things to the ultimate point at which we may feel a sense of ‘sublimity’. Olga Jegunova is not only a remarkable pianist, she is also a very good and special person who, as a true and dear friend, had shown me extraordinary kindness at critical times. We heard Poulenc’s exquisite ‘Cavatine’ for cello and piano, and the opening chords made a deep mark on me. The realm of musical composition can be a place of solace, in which we can hear inevitable beauty and allow it to take over our very being. Olga needed a present, and she needed something to stop thinking about new music as ‘professional noise’, so I embarked on writing a series of pieces that contained all the elements of traditional songs that we associate with the likes of Schubert and Wolf. Melodies with harmonies. Strangely, I found myself composing pieces where the notes became rather hard to organize, tricky to get right. There was to be no ugliness, no harsh dissonance, just a natural progression from note to note or chord to chord where tensions could naturally increase or subside. The lazy ribbon and the closed book. And everything seems dark to me and all seems futile. In his time, hears that which speaks low to him. The flower of life is but ashes in its fruit. To approach the limits of silence. These two songs were written at the request of as well as for my dear friend, the renowned singer Sarah Connolly CBE. Sarah knows me well and when I asked her if she had a poem she wanted me to set, she came up with Henri de Régnier’s ‘The Voice’. What an inspired choice! Of course, Sarah knew what these words would mean to me as she was well aware of the machinations life can bring at particular times. Yet ‘The Voice’ is a sad poem and I wanted to write something that expressed the beauty of life. I found in Régnier’s work an exquisite poem called ‘Wish’, and so this seemed an ideal partner. One in which the sorrows of life are transformed into the gentleness of what the human spirit can think of when either surrounded by goodness or when capable of looking beyond current circumstances to a better place. 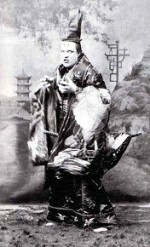 MacMillan famously said ‘Events, dear boy’. Things happen and at times of crisis, the fortunate artist within us can say ‘Enough’, and it is time to inhabit only beauty. 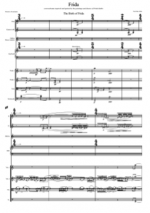 In early 2013 I set about composing four pieces for unaccompanied choir that I dedicated to kind and special people all of whom demonstrated infinite humanity and grace. Each piece chooses texts of great significance. Mahler’s setting of ‘Ich bin der Welt’ is surely one of the most sublime pieces of music ever created by any composer. Yet I had known it corrupted. In order to dispel that memory I set Ruckert’s telling words in a wholly different way. I dedicated this work to a Dean of Chapel, Dr Jeremy Law. Interestingly, I can now hear the Mahler again with fresh ears, and I truly understand it. So the experience of composing these works was not only deeply cathartic, it was also a way of me creating beauty out of ugliness and challenge and saying things in music I would not wish to repeat in words. Maybe one day a musicologist will have a field day? 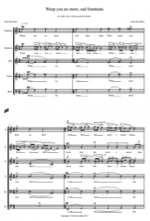 In early 2013 I set about composing four pieces for unaccompanied choir that I dedicated to kind and special people all of whom demonstrated infinite humanity and grace. Each piece chooses texts of great significance. John Dowland’s ‘Come Heavy Sleep’ is a song I had reworked long ago, then realised by the leading mezzo-soprano Sarah Connolly CBE when she was a student with me at the Royal College of Music. This new setting keeps Dowland’s text and melody intact, but finds a new hypnotic quality to the soundscape that weaves around it. It is dedicated to Sarah. 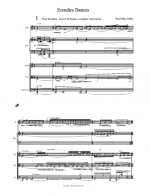 In early 2013 I set about composing four pieces for unaccompanied choir that I dedicated to kind and special people all of whom demonstrated infinite humanity and grace. Each piece chooses texts of great significance. ‘Weep No More Sad Fountains’ is a well-known song by John Dowland. My reworking explores its tenderness, its dreaminess and its magical qualities, exuded by the twists and turns of Dowland’s original melody. It is dedicated to Sally-Ann Edlin. 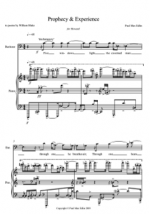 In early 2013 I set about composing four pieces for unaccompanied choir that I dedicated to kind and special people all of whom demonstrated infinite humanity and grace. Each piece chooses texts of great significance. ‘Octo Beatitudines’ is a rich setting of these famous Christian values. 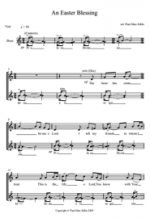 Two antiphonal choirs create dramatic yet beautiful sweeping textures. This work came to life in a surprise performance given by outstanding Cambridge choral scholars directed by the remarkable Suzi Digby OBE. It is dedicated to the current Artistic Director of the Royal Northern College of Music, Michelle Castelletti.